I had a friend and a cousin in London turning 40 in the same week at the beginning of February and decided I’d celebrate with them. I had bought a return ticket when I was in London last year so I didn’t need to buy another ticket – and I managed to use my air miles for a flight back to Dubai. The last time I was in London it was a really hectic trip and I was determined not to do that again. I wanted to relax and hang out with my friends. Sadly, even the best laid plans go astray. I was dreading the cold. One winter away and I’d turned into a wimp. I hardly packed any clothes as my Dubai wardrobe would have been completely useless there! I wore the one pair of closed slip-ons I own, my jeans, a t-shirt, a hoodie, a scarf, and luckily I had brought my coat with me when I moved. My plan was to get a minicab from the airport, go to the storage place to get my winter clothes, and then go to my cousin’s place where I was staying. The journey really made no sense as I’d have to go from Heathrow to St John’s Wood and then back to Gloucester Road – and when we drove past Gloucester Road first I decided to just go home and drop my stuff off. I’d collect my winter stuff the following morning. So from the time I landed, I’d been getting messages from friends telling me to join them at our usual pub in Oxford Circus. ‘Come straight from storage,’ they said. ‘Erm – and what about my luggage?’ ‘Bring it!’ I was actually very tempted – and had I gone to St John’s Wood like I planned I probably would have done that! Anyway, I dropped my stuff off at my cousin’s place, freshened up and headed to Oxford Circus. I caught up with a few of the guys – it was so good to see them! We had a few drinks and all headed home. That night my cousin and I went to see her sister whose twins were almost 5 months old. I couldn’t wait to meet them but they were both asleep by the time we got there. I did get to hold one of them though. We ordered some pizza and had some cold cuts and wine. It wasn’t a late night as everyone was quite tired. 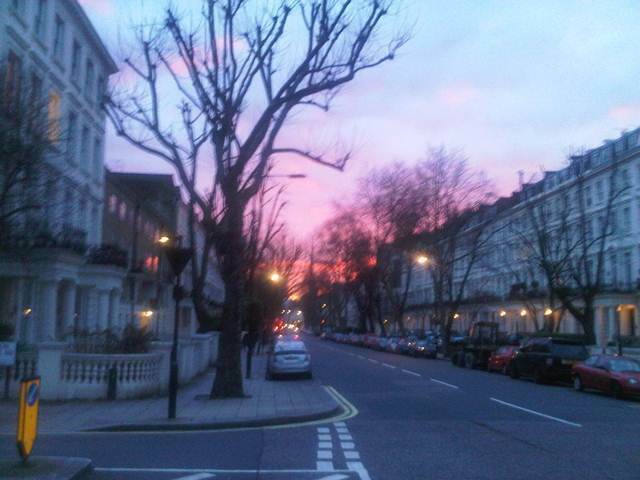 On Saturday morning I went to St John’s Wood to get my boots and jumpers. I opened the bag with my things in it and pulled out my boots and five jumpers: grey, grey, grey, grey and grey. I can’t believe how much grey I used to wear! My wardrobe has completely changed now – a combination of being a smaller size and living in sunnier climes! After dinner we went to Annabel’s for some more drinks and dancing – we were there till they closed! I had checked in my coat at the cloakroom, tucking my black shawl with the diamantes into the sleeve of my coat – but when I went to collect it at the end of the night my shawl was missing! I was so annoyed – it was my favourite shawl and my warmest… The woman in the cloakroom said she’d call me if it showed up but I knew it was gone for good. I met up with a schoolfriend for lunch on Sunday. She was staying at her parents’ place in Wimbledon for the weekend and I was thrilled when she said she’d meet me at Gloucester Road as she had to come into central London. We walked to Ask and sat down for some pizza and a glass of wine. I couldn’t believe I was actually having another drink after the night I’d had. We spent a couple of hours together, catching up on our lives and then she had to go. I had no plans for that evening so I went over to some friends in Portland Place (where I stayed last time) and hung out with them for the rest of the day. We got a take away from Pearl Liang (I really fancied a hot and sour soup!) and by the time we were done with dinner we all looked like we were going to pass out. Monday was a long day. I met a friend for brunch at Raoul’s. 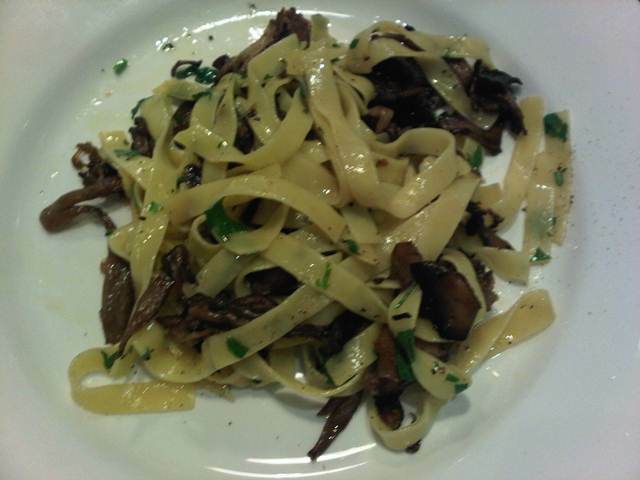 Instead of my usual scrambled eggs and sausages I decided to have the mushroom tagliatelle with truffle oil. It was delicious! After lunch I ran some errands for my mum and then walked from Park Lane to M&S and Selfridges. I was just browsing – wandering around aimlessly. I decided to walk up Baker Street and then to St John’s Wood. I walked down St John’s Wood High Street and realised I still had an hour to kill before meeting my cousins at Richoux so I went to Starbucks, ordered a chai latte and read my book until 4pm. Is that sad?? I met three of my cousins (including the birthday girl) for tea at Richoux. My mum had asked me to have a scone for her so how could I refuse? We met for just an hour as everyone was rushing off to do other things. People are busy in London! I met up with a friend who I hadn’t seen since before I moved to Dubai. He had moved to Hong Kong a couple of months before I left London but was now back in town. We met at Baker Street and walked to The Marylebone on Marylebone High Street. 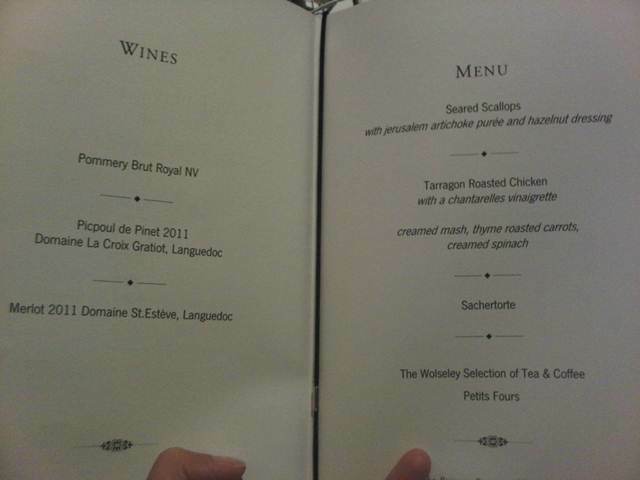 I had a couple of glasses of red wine (which were quite unnecessary). It was great to see him and catch up – we’ve known each other since we were about 6 or 7 years old! After I met him I headed to Tsunami where I was meeting the girls for an early dinner. I’d forgotten how good the food is there – the nasu goma, the ohitashi, the crab shiu mai. Just divine. I think the starters there are much better than the main course dishes they have (although their black cod is excellent too). I was so full by the end of dinner I could barely move. I was home by 10pm and rolled into bed, absolutely exhausted. To read more about London, click here.